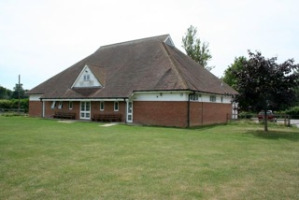 The Parish of Chilham is very lucky to have an excellent Recreation Ground and Sports Centre for hire thanks to the efforts of several local villagers in the past. Chilham Parish Recreation Ground Trust (CPRGT) has been set up as a Charitable Trust responsible for the care, maintenance and improvement of the Recreation Ground, Tennis Courts, Children's Play Area and Sports Centre in Branch Road, Chilham. We have a 10 x 20 metre sports hall with a sprung wooden floor fitted with basketball nets and the floor is laid out for a wide variety of court activities, including badminton, short tennis and 5-aside football. The Centre is equipped with superb changing facilities with showers, including toilet and shower facility for people with disabilities. Outdoors there is a well maintained playing field and football pitch. 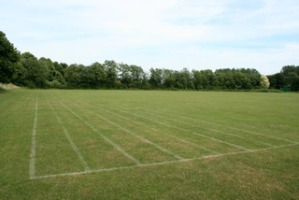 In Summer the field is also marked with a rounders pitch and running track. 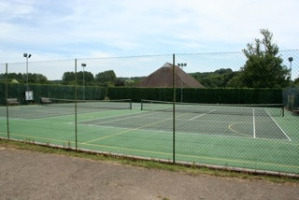 In addition, the Centre offers a successful tennis club with two floodlit courts. A meeting room for up to 20 people and a kitchen complement the sports facilities and are available for any club meetings, including non-sporting clubs. Ample parking is available for all users of the Centre or grounds. We welcome new hire enquiries from clubs, groups, families and individuals. There is no membership requirement to book the Sports Centre. Each of the existing clubs has its own membership rates or weekly fees and if you wish to join any of these, please speak to the relevant person on the Contact page in our website. We are happy to consider any sporting or recreational activities - so far these have ranged from aerobics to radio controlled indoor aeroplanes.